Fate has conspired once again. For those out there that are avid readers of our blog, you might remember a lovely couple by the names of Dianne & Anthony, who came to us here at SDE Weddings, Toronto’s premier wedding videography, cinematography and photobooth group, for filming of both an engagement highlight film and for their full-fledged wedding. That was quite a few months ago in October. Well, ever anxious as we are here, we finally caught up with Dianne & Anthony again on the day which culminated their journey together thus far, the monumental wedding day, taking place just this past January 10th, 2015. 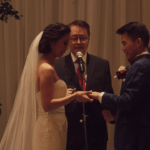 With a new year, a new start and a new life ahead of them, Dianne & Anthony were ever excited just as how our videographers and cinematographers met them at first; eager to pave new paths in their lives together. And we here at SDE Weddings were utmost proud in helping the all-too-spirited couple in capturing and commemorating such a momentous day in their lives. With a complete Catholic wedding ceremony at Mississauga’s Cristo Rei Parish, an evening to start a lifetime with at Mississauga’s Apollo Convention Centre, our videographers and cinematographers capturing every sentimental moment, and our namesake Same-Day-Edit played for them to close the night, Dianne & Anthony couldn’t ask for anything more perfect. Keep your cursors scrolled to learn more about Dianne & Anthony, their unforgettable wedding day, and how our videographers and cinematographers helped to make their matrimonial magic last a lifetime. A throwback from our time with Dianne & Anthony filming their engagement film at Toronto’s Kensington Market, it surprised us how Dianne & Anthony’s story started so innocently yet blossomed into something magical. Indeed, the start of their magical day began with filming the prep for both bride and groom at Toronto’s ‘Homewood Suites by Hilton’ hotel . In a heartfelt and sentimental scene, Dianne had held back tears before finally opening the proverbial floodgates as she read a lovingly written note from her husband-to-be, Anthony, specially for her on the day which would define their lives together; a favourite shot of our videographers and cinematographers from the morning, and helps to tell a tell in the storytelling of Dianne & Anthony’s wedding film. The first look between bride and groom would take place at the hotel’s lobby, in a private and intimate setting which made for plenty of perfect shots for our videographers and cinematographers; and ample opportunities for a full 360-shot as well; also featured in the highlight reel. With a setting of gorgeous chandeliers and a refined Art-Deco interior, the morning’s scenes for our cinematographers and videographers’ highlight and Same-Day-Edit were certainly suffice to set the mood for what’s in store for Dianne & Anthony’s wedding day. Big, bright and beautiful. That’s exactly what Dianne & Anthony’s wedding ceremony looked like under giant stained-glass windowpanes that drew the perfect lighting for Dianne & Anthony’s perfect moment. 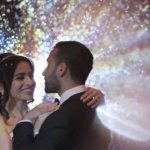 In our highlight reel, you can see how our videographers and cinematographers took full advantage of such ideal filming conditions to capture some amazing shots of the couple down the aisle. An understandably teary-eyed moment caught on film, Dianne & Anthony’s vows are also featured on the highlight. Truly a beautiful moment and many beautiful shots of a sharing of true and heartfelt emotions between Dianne & Anthony at the apex of their wedding day, and a new life between the two made complete and sealed with a kiss. To wind down the day, Dianne & Anthony had chosen Mississauga’s Apollo Convention Centre for their post-ceremony reception and celebration. The newlyweds were happily welcomed with their names writ-large in hollywood-themed letters, which certainly matched Dianne & Anthony’s star-qualities and their extravagant entrance to match a larger-than-life couple. A favourite shot of our videographers and cinematographers was Dianne & Anthony’s first dance. A subdued and romantic atmosphere shared with us and the many guests, friends and family. Indeed, it is a scene that you can’t help but feel warm over. A true honour as well was afforded to our videographers and cinematographers as our Same-Day-Edit was featured preceding the denouement of the night. In the end, our videographers and cinematographers here at SDE Weddings, Toronto’s premier wedding videography, cinematography and photobooth group, had a wonderful time working with Dianne & Anthony from their engagement film to the final minutes of their wedding day, and truly wish the newlyweds many more happy memories to be had together. Here is the wedding highlight video that we made for the lovely couple. We also made an engagement video for the couple.